After a deep and restful sleep, we woke early on Day 27 in time to join the morning meditation practice held in a small temple atop the old barn. Afterwards we wandered the grounds and explored the garden, each harvesting a delicious handful of ripe Sungold tomatoes. The morning was chilly so we made our way back indoors to savor tea & coffee over a crossword. Kirk cooked a delicious breakfast, in quantities fit for thru-hikers: scrambled eggs (from their chickens), potatoes 3 ways, freshly baked biscuits (with huckleberry jam), vegetarian sausage, fresh sliced tomato, and pickled cucumbers. We ate our fill and enjoyed conversation with Kirk and the other two Abbey guests, David & his partner. Kozen had planned to drive us to the trailhead and deliver the bear-resistant barrels that the Abbey places at the PCT crossing of Road 23, and keeps stocked with trail magic throughout the season. When he ended up with a last-minute schedule change, David offered to drive us there in the Abbey's truck. Suddenly without a time constraint, we lollygagged a bit in this lovely place. Finally we both had quick showers (it felt strangely redundant since we got clean last night and had barely even been outdoors, but it seemed crazy to pass up the opportunity for a shower), packed our bags, said goodbyes, and loaded into the pickup. David lives in SF, has many years of experience hiking in the Sierra, and was quite interested in our journey so we continued a lively conversation on the road. He dropped us off in time for an 11:00am start, and we waved as he turned the truck around. The main building at Trout Lake Abbey. Our guest room was upstairs, overlooking the back gardens, and the bathroom had a view of Mt Adams. 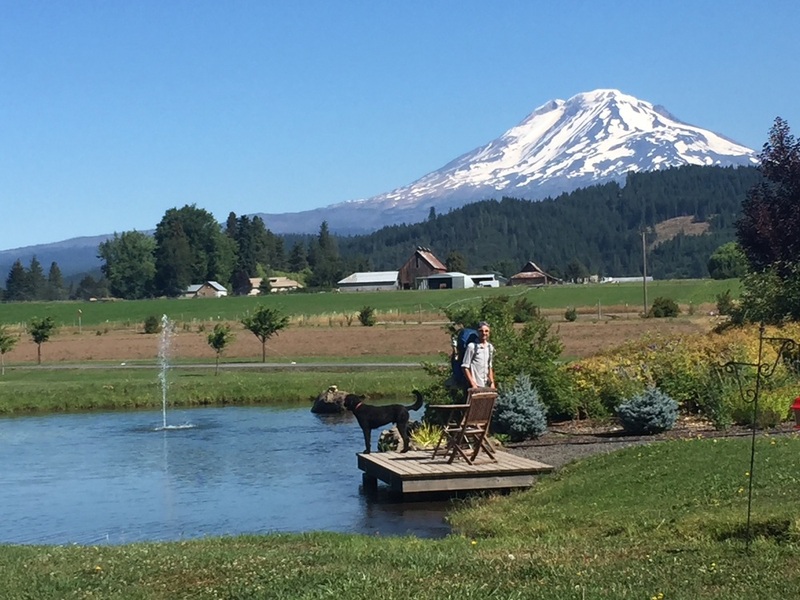 By the Numbers: We stayed just under 17 hours in Trout Lake, and spent $103. Here's how it broke down: $16 - a huckleberry milkshake apiece for us, and one for our trail angel Janet (we were happy she allowed us this kindness, as Doug seemed unlikely to accept gas money); $2 - razors; $85 - room with double bed at the Abbey, including private bath across the hall with a deep soaking tub/shower, and cooked breakfast for two. They also provide reasonably robust WiFi (by WA PCT standards), access to a clean, large, and modern kitchen, coffee/tea, and use of their high end washer/dryer for laundry. Additionally they gave us two bottles of hard cider, fresh veggies and cut fruit to supplement our dinner, and encouraged us to harvest whatever produce we wanted from their garden. Being welcomed warmly by the community of Trout Lake, and treated like honored guests at the Abbey, was priceless. Sometimes the PCT crosses roads. This one had plenty of roadside flowers. With our late start on a hot day, we were glad to find our route was primarily forested. The trail made several climbs and descents, but nothing terribly steep or long. Before we knew it we had gone 5 miles and we stopped for a snack. Our first section hiker came by sweating, and warned us of the mosquitos in the miles ahead. He had planned to camp at Blue Lake but the wind had been too strong, so he came a bit further and tucked in at Deer Lake. We thought wind was far preferable to mosquitos and said so, but he shook his head and said this was some wind. He lives in Port Angeles, WA and we commiserated together about the recent heat wave given our preference for moderate coastal temps before hiking on. We passed several other groups of section hikers, all of whom had a comment about mosquitos though none mentioned wind. The general consensus was that Indian Heaven has the highest concentration of mosquitos, with Blue Lake and environs the epicenter. Of course that lake was our target for tonight's camp. As we have learned, the weather (especially the wind) plays a strong influence on these little pests, and it had been breezy so far today. We had our fingers crossed for more wind. We passed a pair of NOBO thru-hikers, both girls and one wearing only a sports bra and running shorts. They repeated the dire warnings for mosquitos ahead, and admonished us to "cover every inch of your skin," which made us both chuckle given their own clothing choices. We passed through one slope covered in ferns and were bit a few times, but nothing major. We decided we wouldn't don headnets and DEET until conditions required it, though we expected that once we entered Indian Heaven it would be unavoidable. With our hiker legs and unchallenging terrain, the miles rolled by as we settled into a walking meditation. Even so, we realized by mid-afternoon that our goal of Blue Lake was probably optimistic for our late start and adjusted our goal to Junction Lake, a few miles shorter. That lake is reported to be shallow, probably wouldn't be as scenic, and might well be a cesspool of mosquitos, but we had to stay somewhere and it was going to have to be in the middle of Indian Heaven given our timing, so we resigned ourselves to this fate. For now, the breeze persisted and we continued our very pleasant day of forest walking. It was a far cry from yesterday's views of 4 volcanos, but a chance to practice walking meditation and to enjoy the small details around us. We enjoyed dappled sunlight and moderate temperatures thanks to our constant tree cover. Just before entering the Indian Heaven Wilderness, we broke out of the forest into a flat sandy field of low brush, high grasses, and short trees. To the south we had a beautiful backlit golden-hour view of Mt. St. Helens, much closer than I expected it to be. There was a stock trailer and pickup truck parked nearby, and a few llamas tied out to graze. A NOBO came striding across the field with his full red-blonde beard. In a Nordic/Germanic accent, he asked if we'd seen his friends Thor & Sweet Virginia. We told him we hadn't asked many names today and he said it was a blonde couple. We thought back to the hikers we'd passed today, mostly section hikers and weekend trippers. None obviously met his description, but some had been wearing hats. We had only seen a few thru-hikers. We asked him if they were section hikers, and/or if they were older. He said no, thru-hikers, and we would know if we'd seen them - they couldn't be missed. They had all left Cascade Locks together and he thought they must be less than half a day ahead of him. We apologized, said we got a late start on the trail today, and it's possible they passed before then. After wishing each other a good hike we all continued on. Entering Indian Heaven we went back into the trees. I'm not sure what I expected from this wilderness but not a beautiful stretch of dry-ish forest with volcanic rock, small but prominent vegetated buttes, and a string of relatively deep and tree-ringed blue-green lakes. Surprisingly our breeze held and there were no mosquitos to speak of. Not more than an hour into the wilderness, we stepped aside to let a couple of fast-moving NOBO thru-hikers pass. The guy had a Viking-worthy head of unruly blonde hair and a thick red-blonde beard, and was wearing only his snug boxer briefs below a t-shirt. The girl had frizzy, short, blonde curls and was wearing a faded red retro t-shirt and short shorts. It took us only a few minutes to realize that this was Thor & Sweet Virginia, not far behind the friend that had been hurrying to catch them (sorry, no pics!). This is so typical of the trail, that you can spend days thinking a fellow hiker is behind you, only to catch up to them and discover that they passed without noticing your tent or while you were off-trail, etc. 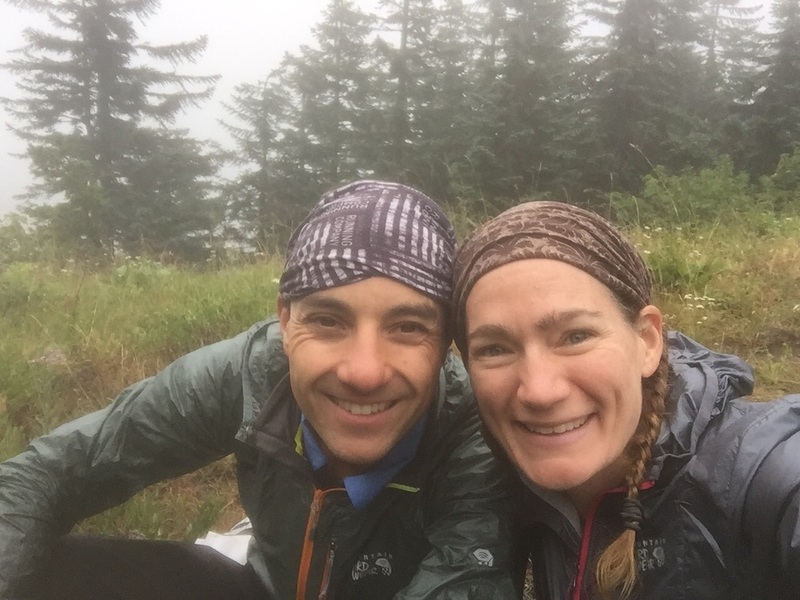 It is also true that you eventually re-connect with almost everybody somewhere along the trail despite highly variable hiking speeds, town stops, and resupply plans. We continued to pass a steady stream of NOBO thru-hikers, more than we've seen in days and also more hikers than we have ever run into this late in the day. We hypothesized that due to the mosquito reputation of the area everybody was trying to push all the way through and camp beyond the wilderness. They were all in a hurry and we had miles to put in ourself, so we didn't exchange more than a quick hello with any of them. We also met a few new SOBO thru-hikers who passed us in the early evening, eager to get a few miles beyond Blue Lake due to the reputed mosquitos. We all agreed that the day had been quite pleasant with no bugs so far, but knew that things could change in an instant. There were some nice campsites at Deer & Bear Lakes, but we wanted to get a little further so we pressed. As we expected, Junction Lake was broad but shallow verging on marshy, but we found a nice campsite near a stand of trees. I started setting up the tent just as dusk fell. The breeze disappeared and suddenly there 30 mosquitos biting my legs, arms, & face with more hovering and waiting to land. I called out to Macro who was getting water from the lake but having the same experience. We threw everything into the tent and hopped in ourselves. Dinner was cooked just outside, reaching only our hands out to control the stove and switch pots. We ate in the tent safe from the swarms of mosquitos that crawled over the mesh. We decided to forgo evening chores in light of the situation, and were about to get comfortable in our sleeping bags when a late SOBO hiker iPod arrived & asked if he could share our site. Macro told him he was welcome if he didn't mind the local fauna, tiny little bloodthirsty creatures. With that, it was lights out and we drifted off to sleep looking at Arcturus and the Big Dipper. We managed 21+ miles today without much effort despite our late start, evidence that we really are becoming thru-hikers. Blue Lake in roaring fog. No campers, no mosquitos. Day 28 dawned damp, misty, and windy. Macro got up first and reported that there were no mosquitos. We wore several layers each to stay warm while eating breakfast and packing up, but were thankful for the lack of bugs. The thickly swirling mist was reminiscent of our early PCT days in northern WA, and also a bit of the coastal fog we get at home where it can be quite windy on the edge of a fog bank. At times we couldn't see the far shore of our lake, and the mist turned the trees into mysterious shadows. We had a long day planned and it was too chilly to sit around, so we hit the trail by 7am. Our camp-mate iPod hadn't shown any signs of stirring, and we wondered when we might see him again. We started hiking in hats and one extra layer, assuming that the heat of moving would warm us up. I was OK other than cold fingers, but Macro stopped to add gloves and another layer to keep his core warm as he has less body fat. The damp wind deposited water droplets on everything and we joked about the aggressive fog, distinguished from light rain by the fact that it gets heavier in thick forest. Less than half of a mile from Blue Lake we ran into a harried section hiker in full rain gear. He had camped at the lake overnight and we inquired about the mosquitos. He said no mosquitos, but it was a hurricane and freezing cold. We said we preferred wind to bugs, but he shook his head and said we had no idea. He warned us that it was about to get stormy and we'd see for ourselves, then hurried along. Sure enough, we dropped into the small notch holding the beautiful azure lake and entered a veritable wind tunnel. Trees shook, small waves pounded the sandy shore near the trail, and we could only intermittently see the screefield on the far shore between banks of mist. There wasn't one mosquito to be found. The scene was beautiful, but we had to agree it was freezing cold and dubbed the weather "roaring fog," several levels beyond just plain aggressive. The mist lifted as we continued south from Indian Racetrack. Once we climbed away from Blue Lake the wind improved, but we still had swirling mist verging on unsettled weather for the rest of the morning. We passed several little meadows, all blessedly mosquito-free. 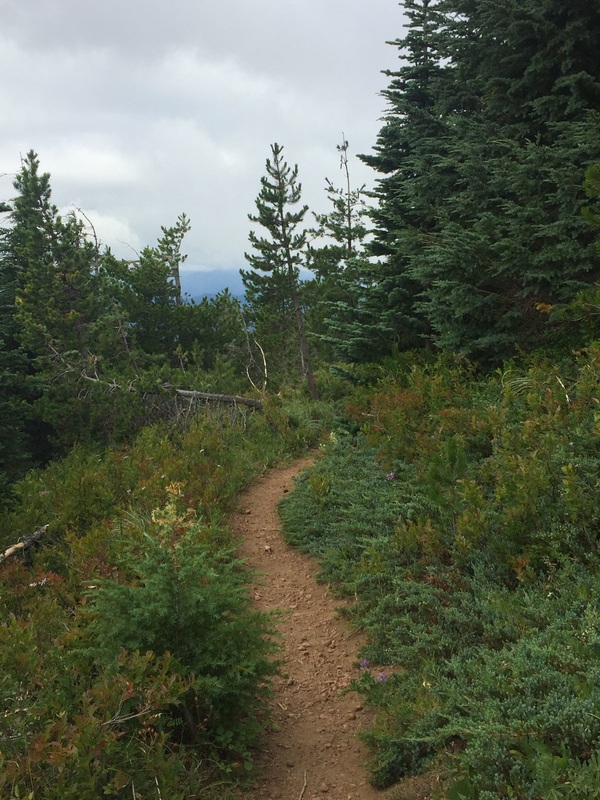 After an area called Indian Racetrack (no idea why), we started a switchbacking descent down what would normally be a hot, dry, and exposed sandy slope covered with low juniper, volcanic rock, short pines, and a proliferation of small but fruit-covered huckleberry plants. The berries were freshly washed and chilled by the recent mist, and perfectly sweet and ripe due to their usual sun exposure. 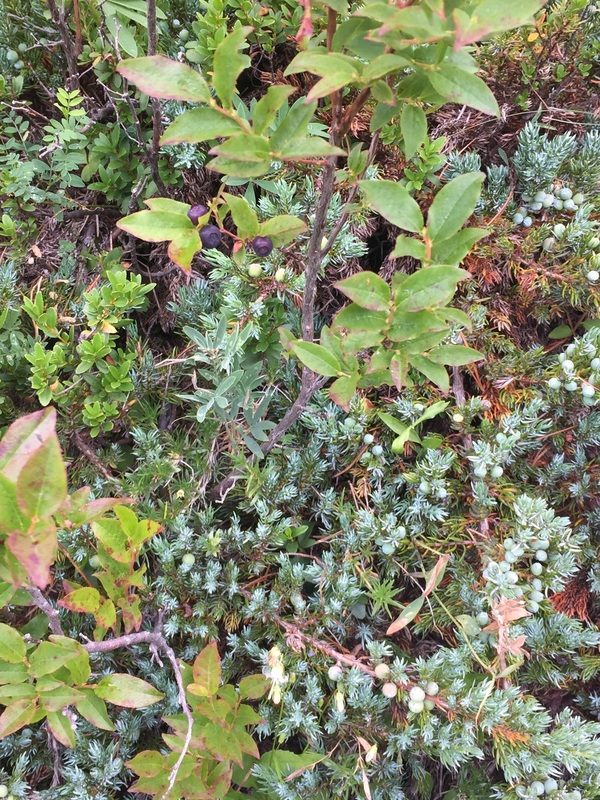 I limited myself to a few small handfuls and ongoing hike-by harvesting of a berry here and there since we had many miles to go and it was cold, but it felt like walking a gauntlet of a different sort to pass by so much deliciousness. There was enough ripe fruit to bake a dozen pies! At some point on this slope the mist lifted enough for us to see the sky filled with layered clouds, and it even looked like rain in the distance. Apparently we were being reminded that despite the string of hot sunny days, this is still Washington. I found the temperature quite pleasant for walking once the wind died down, though we continued to have variable mist all morning. We walked along the border of a lava flow, intrigued by the piles of moss-covered dark volcanic rock with large defects creating small grottos and cave-lets. Wildflowers and twisted trees somehow managed to grow in patches of soil between the rocks and all were made more interesting by the grey day. Despite all of the moss and the thick mist, this stretch of trail is quite dry with few water sources. We planned to stop for extra water at a piped spring before starting our climb up Big Huckleberry Mountain. We passed a deserted campground at the Crest Camp trailhead, then headed back into the forest for the final mile before the spring. Even with the tree cover we realized that our aggressive fog had turned into light rain, and pulled out our trekking umbrellas. We were happy we did as the rain became steadily heavier. By the time we reached the white PVC pipe trickling water into a grotto just above the trail, we were ready to don rain pants to protect our lower halves from the wet vegetation. After the spring we started a long gradual climb, passing our first broad-leafed rhododendrons (sadly, well past blooming time) in a particularly lush stretch of hillside. We saw numerous salmon-colored snow plants emerging from the thick forest duff and started to see more maples and other deciduous trees. The only thing missing was ripe huckleberries - who named this mountain, anyway? We put away our umbrellas when the rain tapered back into mist, but kept rain pants on due to wet vegetation draped over the trail. We passed a handful of hikers, all done up in rain gear, but were happy for the cool temps by the top of our steady climb. We had planned to make the side trip to the summit for the views, but reached the saddle in thick fog and decided there was no point. Instead, we stopped for a snack at a deserted campsite and enjoyed the grassy area with tall, dew-covered wildflowers. We had made good time so far today and decided to push for the second of our two campsite options. We were 15 miles in, but it was still early. If we made it, this would be our furthest distance hiked and first 30-mile day.